As any dog owner would know, grooming your dog can be one of the most overwhelming aspects of having a dog. Sure you want to do it yourself, but everybody knows how difficult and time-consuming it can be to do so. Grooming your dogs proves to be a good bonding experience for you and your dog, but not many people groom their dogs because of the difficulty. While you may still want to take your dog to a groomer for haircuts and such, using a comb on your dog whenever possible will not only help improve the look of your dog’s coat. But it will also save you some money on grooming, as they will need it less frequently. The following guide will help point you in the right direction and help you buy the best dog combs! Cutting lengths from 1/8" to 1"
The Safari De-matting Comb is designed to make grooming and combing your dog as easy as possible. It features stainless steel, serrated blades to allow for minimal contact with your dog’s skin while in use. This particular comb is designed to easily remove mats and tangles in your dog’s skin, while also providing maximum comfort to the user with dual thumb grips. The Safari De-matting Comb is highly recommended by professional dog groomers in the field and is adaptable for most users as the blade can be reversed for either right or left-handed use. This particular comb ​is recommended for medium to long-haired dogs and is most effective on coarse or long, matted coats. For best results, always comb in the direction of the hair growth. The Andis Pet 7-1/2-Inch Steel Comb is about as basic of a comb as you can find for your dog, but it still manages to get the job done for both you and your dog. The design of the comb is nearly identical to what a human comb looks like and accomplishes the same thing. While it is made of durable steel, the Andis Pet Steel Comb is lightweight and easy to use for even beginners. ​This steel comb is designed to help stimulate the skin and hair follicles of your dog while in use and is the perfect comb for finishing and fluffing your dog. While the comb itself isn’t enough to completely groom your dog, the Andis Pet Steel Comb helps remove tangles, loose hair, mats, and dirt from your dog’s coat. ​The Andis Pet Steel Comb features both coarse and fine teeth. If you find the 7 1/2 inch comb isn’t quite big enough for you, there is also a 10-inch version of this comb available. The FURminator Curry Comb is the perfect solution for anyone who is looking for both a comb for their dog and a messaging unit to provide their dog with maximum comfort. This comb is the perfect solution for removing dust and loose hair from your pet and, like most other curry comb is the perfect choice for short to medium-haired dogs. For this particular comb, it is not recommended to use on long-haired dogs because it will be ineffective and can cause discomfort for your dog. The FURminator Curry Comb has molded rubber teeth that help stimulate the production of natural oils to increase the health of your dog’s coat. Also, it features an ergonomic handle designed to be comfortable in your hand during use. The plastic on the handle is anti-microbial to help keep germs and bacteria at a minimum and help keep you and your dog safe. The Chris Christensen 000 Fine/Coarse Buttercomb is the perfect comb choice for anybody who is looking for a simple, yet effective comb to use on their dog. This comb is built to last a lifetime with stainless steel teeth that embed into a solid brass core for an ultra-strong, ultra-durable comb. Each comb is handcrafted to the smallest detail and because of that, you’ll be able to get the most out of this comb. Each and every Chris Christensen 000 Fine/Coarse Buttercomb features a flat spine and a rounded core so it will glide through each coat flawlessly. In addition, the teeth on the buttercomb are seamless and smooth so they won’t catch hair and they will provide maximum comfort to your dog. The Wahl Professional Animal 5-in-1 Stainless Steel Comb features eight different comb lengths so that you always have a proper comb length to suit the needs of both you and your dog. The lengths of the blade vary from 1/8 inch all the way up to 1 inch. For choosing the right size, each blade is color coded and clearly marked. The combs attach onto any Wahl 5-in-1 blade clipper and can easily be taken on and off. For complete control over the combing process, the comb attachments securely attach to the 5-in-1 blade clipper so you have peace of mind knowing that the comb will not slip off while in use. Also, each blade has smooth tips to eliminate any possible snags while in use. ​The Wahl Professional Animal 5-in-1 Stainless Steel Comb also comes with a 30-day satisfaction guarantee, so if you’re unhappy with the product for any reason, Wahl will issue a full refund. As any professional or amateur groomer will tell you, one of the necessities to have is a flea comb. The Master Grooming Tools Contoured Grip Flea Comb is the perfect flea comb, as it features stainless steel teeth that are spaced so closely together, you will have no problem eliminating fleas, debris and flea eggs from your dog’s coat. The stainless steel pins glide perfectly through the skin while effectively removing any fleas and also giving your dog’s coat the perfect shine and smoothness. The Master Grooming Tools Contoured Grip Flea Comb also features an ergonomically designed plastic handle that fits easily in your hand. This design allows for continued use of the comb without any fatigue. Lastly, the Master Grooming Tools Contoured Grip Flea Comb is packed into a compact design that can easily fit in your pocket and can be brought with you just about anywhere! To make it even better, this flea comb features a lifetime guarantee. How to Buy The ​Right Dog Comb For Your Dog? If you’re heading to buy a dog comb, there’re a couple of things you want to keep in mind. The most important thing for you to remember is that all dog combs are not created equally. 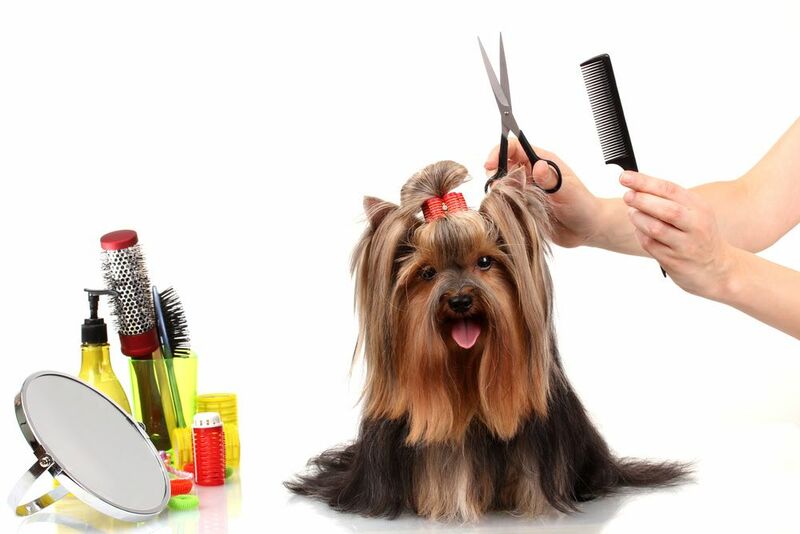 ​There are many different types of combs and it depends on the breed of your dog to determine which comb is best. Always make sure you’re purchasing a comb designed for your dog’s coat type, as it can cause discomfort for your dog if you choose the wrong one. Additionally, be sure you purchase the correct comb for your intended use. For example, there are de-matting combs, flea combs, metal combs and curry combs, so always make sure you know the uses of the comb before purchasing. As the name would suggest, flea combs are designed to be used for getting rid of fleas from your dog’s coat. These combs have very fine teeth that separate the hairs enough to find fleas and their excrements. Dematting Combs typically have fewer teeth that are spread widely apart from one another. The end of the combs is usually sharp to help cut through any mats in the coat. If other methods of de-matting are not working, a de-matting comb is most likely going to get the job done. Metal combs are always recommended because they are not only more durable than plastic, but they are capable of getting through any tangles in your dog’s fur while combing. Curry combs are made of rubber and are designed to massage the skin of your dog while also removing any dead hair. Curry combs are most effective on short-haired dog breeds. While there are some dog owners out there that don’t like to groom their dog, buying the right dog grooming brush can make all the difference and can provide both you and your dog with an enjoyable bonding experience. Whether it be a flea comb, a de-matting comb, a curry comb or another type of comb, there’s a comb out there that will work for your dog’s coat. The recommendations listed above are a great place to start your search for a dog comb! No matter what type of comb you’re looking for or what dog you have, one of the comb’s on the list is sure to be the right choice for you!